Seventh Grade teacher Joel Bezaire uses a collection of over 125 resources he’s gathered from around the web to let students see how math is used in a variety of contexts outside of a math classroom. 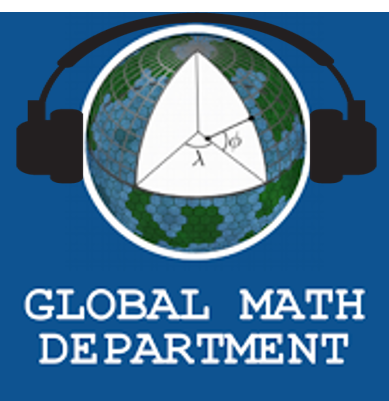 In this Global Math session come hear how his system works, see some of the resources, see student work samples, and discuss together the ins-and-outs of making a system like this a success in your own classroom (As seen in 2018’s NCTM MTMS Blog on MyNCTM). Last week Shannon Kiebler presented the webinar, Fostering the Equitable Math Talk Community. If you missed it, make sure to catch the recording! Don’t forget – recordings for all previously held webinars can be found here. Numberphile is produced by video journalist Brady Haran and features mathematicians describing some really interesting mathematics in an entertaining and easy to understand way. They recently started a podcast, and their newest episode features an interview with the “Klein Bottle Guy” Cliff Stoll, an astronomer, author and educator. Michael Jacobs tweeted that “This @numberphile podcast with Cliff Stoll is a must listen for any teacher. What struck me is the massive impact (positive or negative) we can have on our students by the way in which we respond to their curious questions.” I couldn’t agree more with Michael. Cliff describes the powerful and profound impact that teachers and mentors in his early years had in shaping his career and educational trajectory. He described tracking down his eighth grade math teacher, fifty some years after being her student, to let her know how thankful he was that she took his questions seriously and fostered his curiosity. Cliff’s stories highlighted for me the important role that teachers have in the lives of their students and how teachers’ words and attitudes have consequences far beyond the walls of their classrooms. This message is especially poignant this weekend as my Twitter feed is filled with descriptions of students on a school trip to Washington, DC behaving in racist, ignorant and disrespectful ways, seemingly within sight of their teachers. Teachers have an important role in naming, addressing and countering these racist attitudes. When I first entered the world of Twitter, Jenise Sexton was one of my first follows. I knew of her math contributions as a state curriculum writer, and as a follower of her blog, learned of her impressive career. With only fourteen years in the profession, she has taught at the elementary and middle school levels, been a team leader, and has been in a coaching capacity at the site and district levels. It was evident to me that Jenise is a natural teacher who believes that teaching is at the center of getting better at mathematics, because twice, she chose to leave her coaching position to reenter the classroom to give her more insight. When I finally met her in person at TMC17 in Atlanta, I was not surprised that she not once spoke of her many accomplishments, contributions, or speaking engagements, but only of the teaching and learning of mathematics, and the elevation of the profession. Now coaching at the district level, her latest blog is unsurprisingly entitled A Case For Teacher Envy. In it, she speaks of her teachers who are just hitting the ball out of the park for their students. She specifically highlights eighth grade educator @tenaciousXpert, whose photos below give a hint of her practice. Her room is divided into four quadrants, reinforcing vocabulary, and she methodically creates natural opportunities for students to build their math intuition. I suspect this educator, like Jenise, sets high expectations of students, often motivating students to continue to work out the math long after class has ceased. I encourage you to read this blog and follow both educators if you haven’t already. Surely, there is much more to come from both. Fawn took a Would You Rather math challenge (with context) and created a similar math challenge stripping the context. She then conducted a survey and blogged about it in Jelly Beans or No Jelly Beans. She surveyed her students, Twitter, and even her own children about which math challenge they’d rather tackle. There’s a 50% chance the results of the survey will surprise you and there’s a 50% chance it won’t surprise you. However, you can be 100% certain Fawn’s choice and reasoning are insightful, entertaining, and heartfelt because she doesn’t “give two shits if they are real-world”. Click here to enjoy Fawn describe the beauty she finds in mathematics. What does the latest research say about growth mindset?